HFS Morgan, who contributes the accompanying story of the three-wheeler which he designed, at the controls of the first model. It was built in 1909 had a 7 h.p. Peugeot engine. My first motoring experience (said "H.F.S.") was in 1899, when I rode a Minerva motorcycle; a little later a 3½ h.p. Benz ran away with me down a steep hill and cost my father £28 for repairs. Both machines had been hired from Mr. Marriot, the first motor trade in Hereford. After this experience I waited until I was 21, when, having collected a little cash, I purchased an Eagle Tandem - a three-wheeler fitted with a water-cooled 8 h.p. De Dion engine. It was fast, but not too reliable, and gave me considerable experience during the 18 months I owned it. I then bought a 7 h.p. two-cylinder car called " The Little Star," which, with modifications, gave good service for many years. On leaving Swindon in 1906, I opened a garage and motor works in Malvern Link. I was district agent for Wolseleys and Darracqs, and I also started one of the first bus services in the country, running special 10 h.p. Wolseley 15-seaters from Malvern Link to Malvern Wells and, later, from Malvern to Gloucester. Now, during this period, I had purchased a 7 h.p. twin Peugeot engine, I intending to build up a motorcycle. Although I had been a keen cyclist, I never cared for motorcycles. I, therefore, decided to fit this engine into a light three-wheeled chassis I had designed, and as I had little facilities for machine work, this was mostly done for me. The chassis was, in fact, assembled in the Malvern College work shop, through the kindness of my old friend, the late Mr. Stephenson Peach, then engineering master at Malvern and Repton. I drove the machine, which I called the Morgan Runabout, in 1909. It was most successful, due to its rigid frame, independent front-wheel suspension and light weight; the power weight ratio was about 90 h.p. per ton, and it was therefore, more than capable of holding its own with any car on the road at that time. Although I had made the Runabout for my own use, and had no intention in the first place of marketing it, the car caused such favourable comment wherever it was seen that I decided to make a few, and with the enthusiastic support of my father, the Rev. Prebendary H. G. Morgan, who risked some capital in the venture, I bought a few machine tools, enlarged the garage and started to manufacture. I obtained my first patent for the design in 1910, my patent agents being Stanley, Popplewell and Co., of Chancery Lane. It is interesting to recall that the patent drawings were produced by a bright youth (then articled to Mr. Stanley) who is now the famous Sir John Black, of Standards. Two Runabouts were shown at Olympia in 1911; they were single-seaters fitted respectively with J.A.P. 8 h.p. twin and 4 h.p. single-cylinder engines, and they created quite a stir! They were too novel to attract many orders (about 30 materialized), but I found there would be a very much larger demand for a two-seater model. Meantime, just after the Show, I entered my first important trial, the "London-Exeter," and won a gold medal. For many years Mrs Morgan always accompanied her husband when he took part in trials. Here they are in a 1913 Sports Runabout, setting out for the A.C.U. "Six Days." 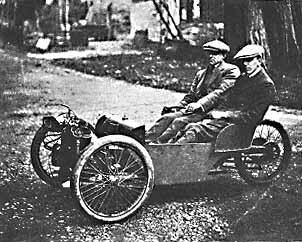 During 1912 I tested a few chassis fitted with two-seater bodies and wheel steering. They were satisfactory, and one of the first was lent to McMinnies for a long weekend. I must say I was surprised at the very enthusiastic report he gave it in "Motor Cycling." It was the first Press road test report of my product ever published. Later McMinnies was closely associated with "The Light Car and Cyclecar," which had been founded in 1912 with the idea of catering for the owners of machines like the Morgan. I recall that F. J. Findon, the present editor of "The Light Car," collected his first Morgan on a day when there was much rejoicing in the Morgan household on the birth of a son! How time flies. Today, son Peter is a director of the company I founded. 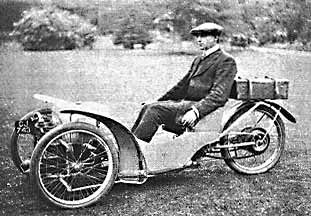 In 1912 I showed several two-seaters at Olympia. They attracted a good deal of attention and with trade support, I obtained far more orders than I thought I could meet. I approached several large manufacturers and (luckily) they turned the proposition down, so, partly with the aid of deposits on orders, I bought machine tools, built some new workshops and, giving up my garage business, did my best to satisfy the demand. The Morgan Motor Company was turned into a limited company in 1912, with two directors, my father being chairman - a position which he held until he died in 1937 - and myself managing director. The prototype two-seater Morgan of 1911, with "H.F.S." at the controls. It had an 8-h.p. a.c. J.A.P. engine and tiller steering. During 1912, 1913 and 1914, I entered for many trials, hill-climbs and races, and, helped by quite a number of enthusiastic owners and agents, the Runabout collected plenty of first-class awards. Our first attempt at Brooklands was in the International Cyclecar Race. This was easily won by Mr. Harry Martin. Later, I broke the 1,100 c.c. Hour Record at a speed of nearly 60 m.p.h. and thus became the first holder of "The Light Car and Cyclecar" Challenge Trophy. In 1913 I produced some racing cars with a longer chassis, low seats and o.h.v. J.A.P. engines. One of these was bought by Mr. Mc.Minnies. who ran it in the Cyclecar Grand Prix at Amiens and won the race. It was a wonderful performance, as he had to change an inner tube of one of the front tyres during the event. After the race this Model was called the Grand Prix, and was popular for many years. During the Kaiser war I was able to maintain a small production, but the works were chiefly concerned with munitions. In 1915 I built a four- seater model for myself and family to get about in. Again it was a stepping- stone, for it was later marketed as the Family Runabout; it filled a long-felt want and sold in large numbers. For some years little alteration had to be made to the chassis, but all sorts of engines were fitted and various modifications made to the bodywork. Electric lamps and starters were added and, as a result of trials experience, front-wheel brakes were soon installed. In 1931 I brought out a model with three speeds and reverse, one chain and detachable wheels. Previously, all models had had a simple two-chain drive giving two speeds. On the sporting side the Runabout continued to uphold its reputation, winning race after race, for example, at Brooklands. In 1930, driving a 1,100 c.c. JA.P. racer, Mrs. Gwenda Stewart (now Mrs. Douglas Hawkes) broke the Hour Record at a speed of over 100 m.p.h. 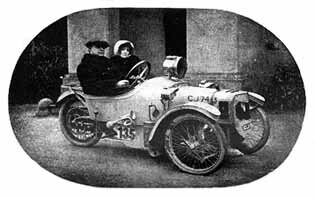 As the attempt was made at Montlhéry, Mrs. Stewart could not claim "The Light Car and Cyclecar " Cup. The year 1935 marked the advent of a new model fitted with Ford four-cylinder 8 h.p. and 10 h.p. engines. This was the best all-round three-wheeler we had turned out and, with slight modifications, it is in production today. For some years, competition from light cars had been getting very severe, owing to the improved performances and low cost of these four-wheelers. Our output dropped, and to keep the works busy I decided to produce a small four-wheeler, light in weight and with plenty of power. I had already experimented with various types. One of the first (in 1914) was fitted with a Dorman four-cylinder engine. Taking the successful four-cylinder, three-wheeler as the basis of design, I produced the four-wheeled models first shown in 1936 at the Paris Olympia Shows. It was called the 4/4. Looking back through the years, seeing both errors and triumphs in their correct perspective, I feel I have enjoyed it all; the motor trade has been - so far as I am concerned - a most interesting business. So far the story as told by H.F.S. Morgan in the Light Car Magazine in December 1949. 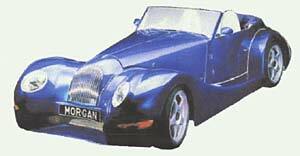 After World War II it was not easy for the Morgan Works to reestablish production of their cars. Sheet steel was in short supply and the British Government allocated it mainly to companies, who could export their products. So the Morgan Motor Company concentrated on producing their four-wheeled cars, which they could export mainly to France and North America. Production of the Three-wheelers slowly came to an end and on July 29, 1952 the last Three-wheeler, a Ford-engined "F"-Super left the Morgan Worcs. The two-seater four-wheeled Morgan of 1936 was followed by a four-seater in 1937 and a very elegant two-seater DHC (Drop Head Coupé) in 1938. Morgan again proved the outstanding capabilities of its cars in competition and races. In 1953 the appearance of the four-wheeled Morgan was slightly changed: The flat radiator gave way to a sloping radiator shell and the once free-standing head lamps were faired into the wings. From now on the look of the Morgans stayed pretty much the same until today. In 1968 Morgan implanted a 3.5 liter V8 Rover engine (the original design of that engine was made by Buick) into its car: The legendary "Morgan Plus 8" was born. Aero 8, an all new model introduced at Geneva in 2000. 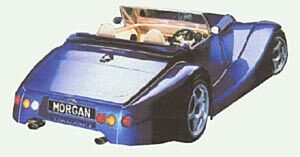 For more information on those cars I advise you to have a look at the homepage of the Morgan Motor Company Ltd.